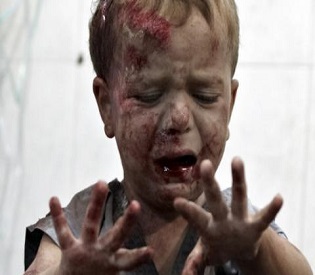 Christian children in Iraq and Syria face deadly attacks by the Islamic State. Their need is both material and spiritual. Tens of thousands of Christian families with children have escaped the attacks of radical Islamic groups in Iraq and Syria. Well-educated and middle class Christian families now live in urban refugee centers with one room for an entire family. There are so many Christian children who are now refugees or Internally Displaced Persons (IDP’s) that no one organization or even one government can help them all. But you can make one special day brighter for some refugee children by arranging a traditional Christmas celebration for them with games, Christmas carols , a hot meal and a gift of food and\or other essential items for their entire family. In 2016, churches and private halls were provided for Christmas parties for thousands of Christian refugee children. Puppet shows, games and Christmas carols, as well as a hot meal served by volunteers, were part of the day, which included transportation to and from the events. From a small beginning, when Christmas events were provided for children in Jordan in 2013, the program has expanded to include Lebanon and Iraq. 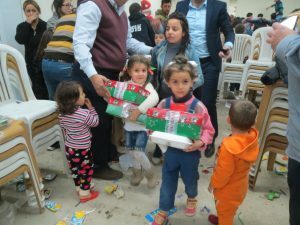 In 2015 the first Christmas celebrations were held in Iraq for the children of Christian families who fled during the ISIS invasion of the traditional Christian area of the Nineveh Plain. In 2016 more than 2,000 children from Mosul and the Nineveh Plain had a real Christmas provided by Christmas for Refugees. The Christmas for Refugees program assists the families of the children as well. Depending on the needs at the location, each family receives about $50 worth of food or a hygiene kit of the same value containing items such as bath and laundry soaps, toothpaste, and other essentials. Another $14.00 covers the cost of the meal program and party for each child, as well as transportation to the Christmas events and Bibles for the children and their families. The total cost per family is $64.00. Please help make Christmas, 2018 a special day for a refugee child who has fled Islamic terror and war. All contributions are tax deductible. The goal in 2018 is to serve as many as 6,000 Christian children and their families for Christmas. Please help by donating $14.00 for a one day Christmas program for one child, or $64.00 for one child’s Christmas program plus $50 worth of food or a box of hygiene materials for his family. Please donate today, as funds must be transferred to Iraq, Jordan and Lebanon well in advance. You can help a refugee child have a Christmas Day celebration instead of another day of hunger. Help a Christian refugee child today!